Clever and crafty, this liar's dice experience is an evolution on the classic bluffing game. 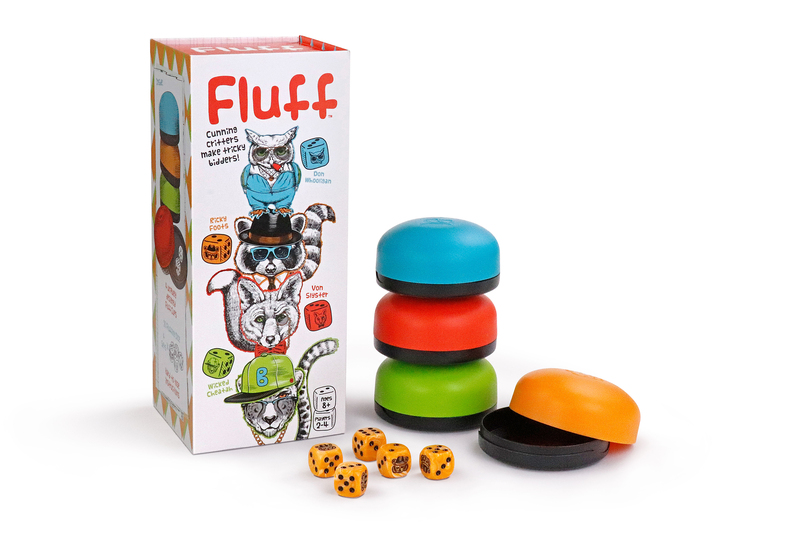 Fluff features palm-fitted rolling cups for poker-style peeking, and critter-adorned dice for "wild-style" play to inspire bolder bidding. Fluff up the bids, or challenge the calls. Be the best fluffer to outlast the other cast of characters.Each player places dice in their cup and gives them a good shake. Take a peek at the dice. Your goal is to "call" the total number of a particular dice across all the hands at the table. So the first player places a bid, such as "I think there are 4 threes across all hands." Player to the left increases the bid or calls. You can only raise the value of the last bid by either increasing the value or quantity. So if I'm the next player, I can say 5 THREES, or keep the quantity the same and raise the value to 4 FOURS.Your other option is to call "Fluff!" on the existing bid. Say I bid "9 FIVES" and you have no fives. You might think I'm bananas, so you call "Fluff!" All players reveal their dice. If there are 9 FIVES or more, you would lose a die. If there are fewer than 9 FIVES, I lose a die, and I'm sad. You may also call "Fluff!" when it's not your turn, but you will lose two dice if you're wrong and the bidder still loses only 1 if you're right. It's risky and frisky!When you lose a die, set it aside for all to see, and start fresh with a new roll. The person who lost the die starts the next round with the opening bid.When you lose your last die, you're out. Now you're sad, too. Play continues until only one player has dice left. That player wins and may celebrate in any way they choose.So be the best fluffer to outlast the other cast of characters.